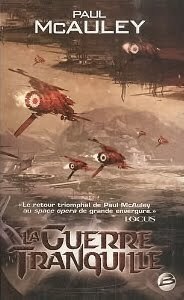 Before I completely forget (I'm insanely busy, trying to nail down the third draft of the ongoing, which is past the midpoint now, thanks), here's the fine cover of the French edition of The Quiet War, the second Sparth cover for the same novel (see also the US edition). Lucky or what? It was published on Friday; my French publisher handed me a copy the day before, at the Gollancz party. Poking around on the French Amazon site, I found that the mass-market paperback edition of Glyphes (aka Mind's Eye) was released last month. The cover for that is pretty good too; it refers to the family history which gets Alfie Flowers in a lot of trouble.